But first, let’s catch you up on what we’ve been playing over the last month! Sparkle*Kitty – a new favorite of Claire’s. Play word cards as “spells” to break down your princess’s tower. Twin Stars – a meaty solo game from Button Shy. Read Anitra’s review. Unlock! The Nautilus’ Traps – We had a few problems with this one. We compare the Unlock! series with the EXIT series; we like them both and discuss pros and cons of each. Spy Club from Renegade Game Studios. We still haven’t managed to win, but we were so close the last time! We also found out we were playing it wrong – idea tokens are not removed from the game when they are “spent” to gain certain actions. They are only removed from the game when cards explicitly tell you to do so. Roll Player – Anitra finally won! Perfect for anyone who likes dice, D&D, and min/maxing. Movable Type – a really neat word-building game from Robin O’Keefe, with player bonuses that can be gained by meeting certain requirements. The bonus cards picture various famous authors, and tie in to the authors in a wonderfully thematic way. 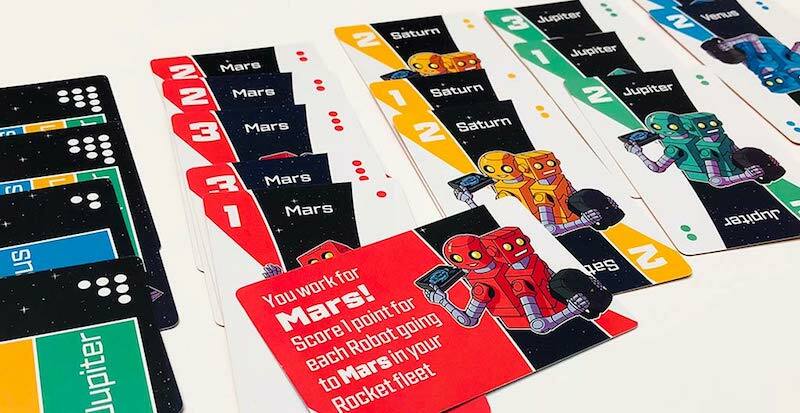 Xtronaut: The Game of Solar System Exploration – a well-themed set collection game. Looking forward to trying it again soon. Dragonwood – it’s been a long time since we reviewed this. Still a great game, and made a nice pre-bedtime treat for the kids a week ago. Inoka – a beautiful game of woodland creatures battling each other, with a rock-paper-scissors mechanic. Nick Martinelli will be reviewing this for us. Ghost Fightin’ Treasure Hunters – of course. Look for the winner of our giveaway! Chronicles of Crime – a really interesting and unique experience from Lucky Duck Games, but not good for most kids or larger groups. Read Andrew’s review for more details. Nick and Izzy review Robots & Rockets. Voodoo – our kids still like this a lot. Place “curses” on fellow players causing them to do silly things. BOO – an interesting two-person puzzle game in a tiny box. A good “travel” game because it fits easily in a pocket or purse. Zombie Dice – a former Family Gamers favorite, it’s been mostly replaced by Batman: The Animated Series Dice Game in our house. But, zombies are a better choice for Halloween! One of the easiest games for young kids to play. Ghost Fightin’ Treasure Hunters – this was highly recommended to us for the last year or more. We are so glad we’ve finally tried it; it will be a favorite for years to come. 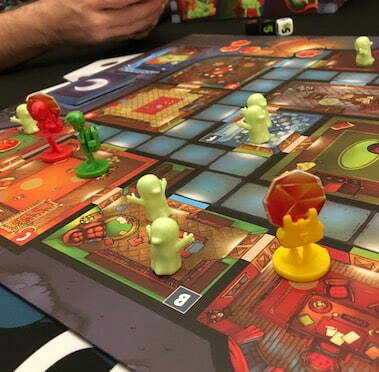 Chupacabra: Survive the Night – another game from Steve Jackson Games. Roll dice to build “flocks”. Steal flocks from your opponent(s) when you roll chupacabra. Expect a review soon! Monster Crunch from Big G Games – spooky monster theme, but not at all scary. Perfect for younger children. Listen to Nick and Izzy’s review. VISITOR in Blackwood Grove from Resonym – as mentioned in episode 114. Spooky alien theme with asymmetric gameplay. Betrayal at the House on the Hill – build the haunted house as you go through it. Try to survive as one of your fellow players betrays you. Read the corresponding book section(s) for elements that will drive the narrative. Best for older children and adults who like horror movies and scary ghost stories. Rob Daviau is working on a Legacy version – why would people keep visiting a haunted house over and over? We shall see. Did we miss your favorite Halloween game? Tell us!